The two most notorious incidents that surfaced as a result of this mob going after Ethan Van Sciver happened in 2012 and 2015. It’s two opposites in the way they’re structured. One details a disgruntled fan who moved into stalker territory to the point where Ethan had to step in and intervene directly. The other story is of someone Ethan considered to be a friend until a podcast that went wrong turned things sour. A key fact of either situation worth pointing out is that Ethan maintains two separate Facebook profiles. One of these is his personal one, whereas there’s a separate one for his professional self. Such distinctions matter when it comes to the instances of drama behavior at the center of this mess. If Ethan Van Sciver made a controversial comment or reply of any kind on his professional Facebook, it would, of course, reflect worse as he’s acting as a public figure. But if an incident occurred over on his personal page it changes the context. On May 29th, 2012, someone by the name of Jeff Hartz made a forum post on IGN detailing a story involving himself and Ethan Van Sciver. The main point Jeff alleges is there was a terrible falling out between the both of them as a result of miscommunication involving a charity project he wanted to do. In light of recent events causing this part of the past to resurface, Ethan Van Sciver responded to this himself in a video at the end of January. But it’s also important to note that Van Sciver acknowledges his “megaphone status” is a responsibility. He tells the viewer he’s not the type of person to address these sorts of drama rumors head on like this. The difference between Ethan’s and Jeff’s retelling is striking. Jeff Hartz’s main point was Ethan Van Sciver is an “internet bully” for complaining about Jeff’s actions on his personal Facebook. Whereas Ethan himself tells us that Jeff manipulated his ex-wife into handing over personal information about their family. That Jeff Hartz was nothing more than an obsessive fan overstepping boundaries and harassing both Ethan and his family. Early on in the video, Ethan explains that this IGN forum post is a copy and paste from another website. Somewhere where the story was originally shared, but Ethan/Gail Simone/DC Comics got in touch with the website hosts and had it taken down. One of the indicators of that (as shown in the picture above) is places of text where pictures appeared to have been. Ethan’s perspective makes it clear that he was kind and personable to everyone. Jeff invited Ethan to come on and they exchanged email addresses thereafter to set that up. He says the “30 or 45 minutes talking comics” bit was more like Jeff stood around while other people were trying to get their books signed. If anything, the guy might’ve talked to his wife Sharis. Her motivations for being decent in interaction were because she wanted to help drive business to this fledgling firearms range that was starting up in Charlotte. Ethan never responded to the guy’s emails. He then says Sharis wasn’t as excited about Jeff ‘s common interests as he’s implying. Sharis “heard” Jeff was going to visit his friends from Jeff himself. He told her. Ethan points out the wording comes off as very buddy-buddy in this guy’s post. What was actually going on according to Ethan was Jeff used the comic book signing as a springboard to try and get close to him. In this case, Van Sciver had like 5000 Facebook friends so the direct approach didn’t work. Sharis was the backup option for this guy. Ethan says the more realistic situation going on was Jeff told Sharis “I’m going to be in North Carolina I wish I could go shooting.” With Sharis saying “yeah alright” in response. Ethan says Sharis giving Jeff her cell phone number was a mistake. He says her intent of inviting Jeff was to promote her job. Ethan points out the fact that Jeff actually shared that his son was punished and how bizarre that is. Van Sciver says Sharis held a position where she was open to answering questions in a straightforward way. Naively giving a default human level of trust when replying to Jeff’s inquiries. Ethan says Jeff was being nosy and invasive, and Sharis had no understanding of how to set up a personal barrier on how much to share with Jeff. Same dynamic as the earlier questions applied to the paragraph talking about Ethan’s autograph hobby. Van Sciver points out that Jeff was using this opportunity with Sharis to ask personal questions about Ethan. Later on in the video, Ethan addresses the differences between his hobby compared to what Jeff was trying to do. Ethan states flat-out that Jeff was not business correspondence. He highlights, in particular, the part where Jeff admits he and Sharis were more friends than they were. It raises the question as to why Jeff was so keen on Ethan then. Ethan says Jeff was sending Sharis text messages for years, and that the couple at the time pointed out how odd it was. Ethan says they were being polite to Jeff. The two discussed at length about giving Jeff that information and said: “this isn’t a good idea” at the time. Ethan points out that the extent of “what [Jeff] could do for this industry” was impose on Van Sciver (using the address obtained by manipulating Ethan’s ex-wife) to send him things to sign. He says he’d have to repack them, go to the post office, and go through the process of sending it all back. On the point of Moose Baumann, Ethan explains that Moose is his personal friend for many years, working as Ethan’s colorist. When Moose and his wife fell on hard times, Ethan went on tour doing a lot of conventions. Part of the cost of getting Van Sciver to come was two plane tickets. One for him, and one for Moose. He came along, staying in Ethan’s hotel room for free, chipping in for Baumann’s meals too. On these outings, Moose was able to sit next to Ethan in artist alley and sell his prints. Further, Ethan sent Moose commissions, paying him out of pocket to color them because Van Sciver preferred Baumann’s talent over his in that regard. Ethan points out he gets requests all the time and that his general tendency in dealing with that was avoiding being rude (ignoring them over declining). Van Sciver states that Jeff was in no way owed an answer to someone who was habitually texting his ex-wife unwanted. Which in itself went on for as long as it did because Sharis did her best to be polite, despite wondering why Jeff was still contacting them all the time. “What you’re doing is harassing my wife with requests of her to make impositions on me,” Ethan says. He gets upset momentarily when Jeff drags Moose’s “conduct in the past” into this dramatic story. According to him, if Jeff was really looking to just be a charitable person he could’ve just donated another $100 to Moose on his own. Without all this hassle. Ethan says he didn’t even read Jeff ‘s post. They saw the guy’s name pop up, knew who they were, and elected to ignore them for it. Van Sciver points out the evidence of Jeff ‘s inflated sense of self-entitlement from that. Ethan did not owe Jeff a moment of his time. He says he gets at least one-hundred of these kinds of request per month. In response to that their blanket statement is he does not want unsolicited mail sent to his house. Ethan reveals he threw them in the garage. As an unsolicited package, he didn’t appreciate it. He asked Sharis what it was, and she didn’t know either. He refrained from signing it because it would just encourage more, similar behavior like that in the future. Sharis agreed with Ethan’s choice. Ethan says it was outrageous that Jeff approached them with this idea. The notion that a stranger finds out where he lives, for one. For two, the idea that Jeff was amenable to just giving that private information out to other people. Van Sciver says Jeff was texting all the time. Every time, Sharis would show Ethan their phone and say “your fan is bothering me again.” In reply, he’d tell her “you shouldn’t have given him your number. I don’t know why you did that.” Ethan says this fiasco was a blip on both his and his wife’s radar, as they had their own lives to attend to. Clearly, at this juncture, it was a boiling point. Ethan says Sharis only gave Jeff their address because he manipulated her into worrying about a sick 10-year-old boy. There was a problem as it created a rift of awkwardness between Ethan and his wife. Van Sciver says Jeff didn’t need mutant powers to understand boundaries. He gives an example of if someone asked George Clooney if they could come over to their house, and Clooney didn’t respond, doesn’t mean anyone can waltz on in that case. “Finally after over four years you overstepped with Sharis,” Ethan says. Van Sciver takes the time to explain the process of his autograph hobby. He mails them out to fan mail addresses that are publicly available on the internet. Ethan makes it clear that Jeff was not. When Ethan sends his DVD sleeves out to these fan mail addresses, he’s fully aware that they may never even be returned to him. Ethan says he doesn’t go on a tirade and call people hypocrites for not going along with what he desires. Ethan says he talked to fans and made the decision to make a little P.O. box. He notes that this box didn’t last very long. A few years go by since that IGN forum post. By mid-2015 Ethan Van Sciver would find himself on the receiving end of a second call-out post. Which piggybacked off the general message, tone, and formatting of its predecessor. What’s different about this case is that the author of it was an actual friend of Ethan Van Sciver’s, for a time. How their friendship came to an end is part of the blog’s story. Ethan Van Sciver made a video response to this as well on their YouTube channel. It’s told in four parts. Part 1 is Alfie’s introduction portion of his situation. He tells us he needs help in what he calls a cyberstalking situation. He names Ethan as the cause of a group of online bullies harassing himself and his loved ones (“my girlfriend, her family, and other friends”). Norris says it started out as “tasteless jokes” that intensified to four men making multiple posts on Alfie’s online pages, daily. He says they set up six accounts impersonating him, posting messages both to Alfie himself and possibly others. The only evidence of past incidents that Alfie can point out in this section is the May 2012 IGN post discussed earlier. Like the last video, Ethan explains his general attitude towards these things is not responding to them. He ignores them because he doesn’t want to look like he’s punching down. Ethan says he’s aware of this dynamic that whenever he responds to these sorts of things there’s the possibility of fans attacking the disgruntled person in question. He takes the time to remind the viewer to not go after these individuals in any capacity. This is the third time Ethan has had to say as such when it comes to Alfie. Alfie used to be a high powered lawyer from Alabama, Ethan says. He doesn’t know if that’s current to this day. The skills from that trade allowed him to pull together a narrative from distant and far apart threads. Ethan had a Facebook page from 2009 to the Trump presidency dedicated to political discussion. Ethan considered that to be limited to just family and friends. There were around 50 regulars that’d drop by daily. The routine was talking about the political articles of that day (going to places like drudge report) and posting a link to it and giving his two cents. The people in the comments would either agree with Ethan or disagree, thus sparking a debate. It was mostly just fun but sometimes it got heated, Ethan made sure to pull things back when that was the case. “Alfie is no longer my friend,” Ethan says. The two had a falling out around the exact time Alfred’s personal life fell apart. Ethan used to feel pity, but then he learned “dark secrets” about Alfie’s past that made him change his perspective. Ethan states that he didn’t have the routine of making “multiple posts on” Alfie’s personal and business pages. Ethan says he’s not aware of who the girlfriend and family or friends he was referring to. Part 2 is where the story really begins. Alfie accuses them of targeting Ian Auld, Steven Seitz, and Randy Pare, for the reasoning of “not being conservative enough” as fans of Ethan Van Sciver. 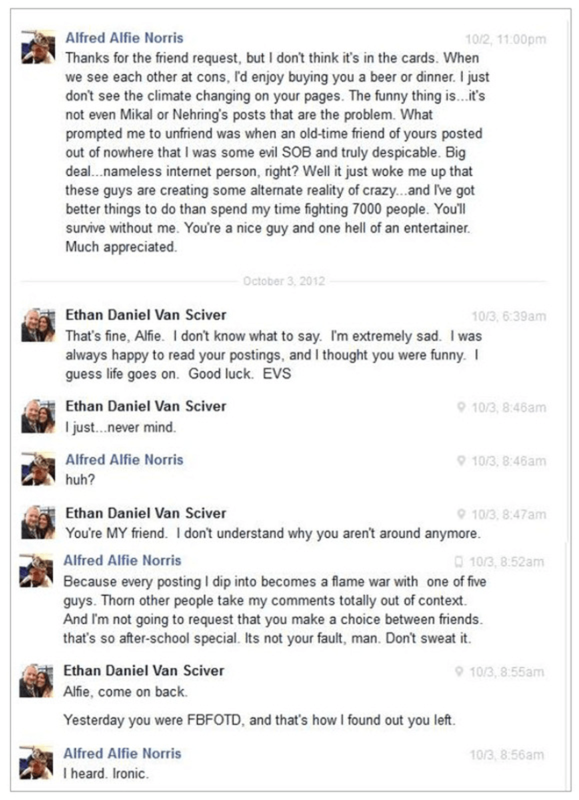 To that effect, Alfie posts a private message showing Ethan Van Sciver admitting to “trying to get Ian going” for fun. He then shares a forum post from someone else describing this dynamic going on online. Alfie shares the same IGN post again from earlier, but separately points out the two comments from others who had negative interactions with Ethan Van Sciver. After that, there’s a full paragraph alleging Ethan and his gang attacked women such as Alfie’s ex-wife and girlfriend. But amidst the slew of accusations about negative comments being left in various places, there are no links to proof nor specifics mentioned here. It’s after that Alfie Norris gets into Ethan’s role in particular. He paints Van Sciver as “playing the good guy” whose method was stringing folks along. In one breath, Alfie shows a screenshot of Ethan apologizing to Alfred. In the next, Alfie accuses Ethan of being the “ringleader” behind it all. 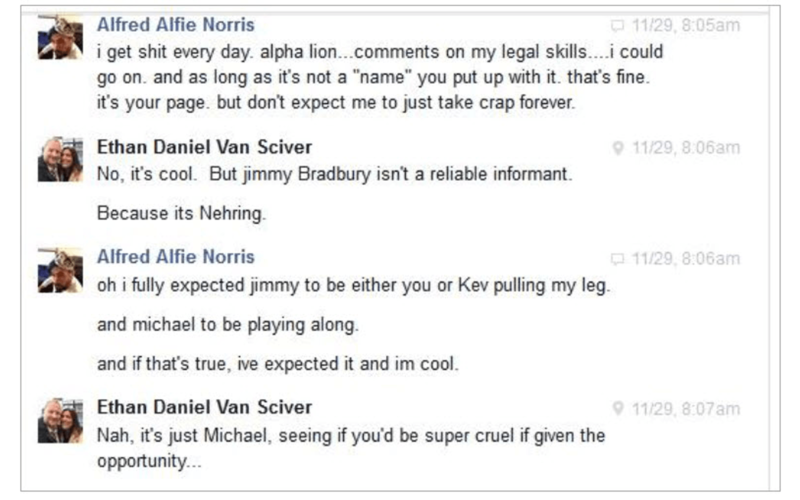 But later on, Alfie shows a screenshot where Ethan admits that it was Michael Nehring behind things like fake profiles. Alfred assigned Ethan as the person in the role of having to babysit his friends. He says he tried to break things off and that led to Ethan and his group attacking him still (doesn’t provide links to anything to that effect). 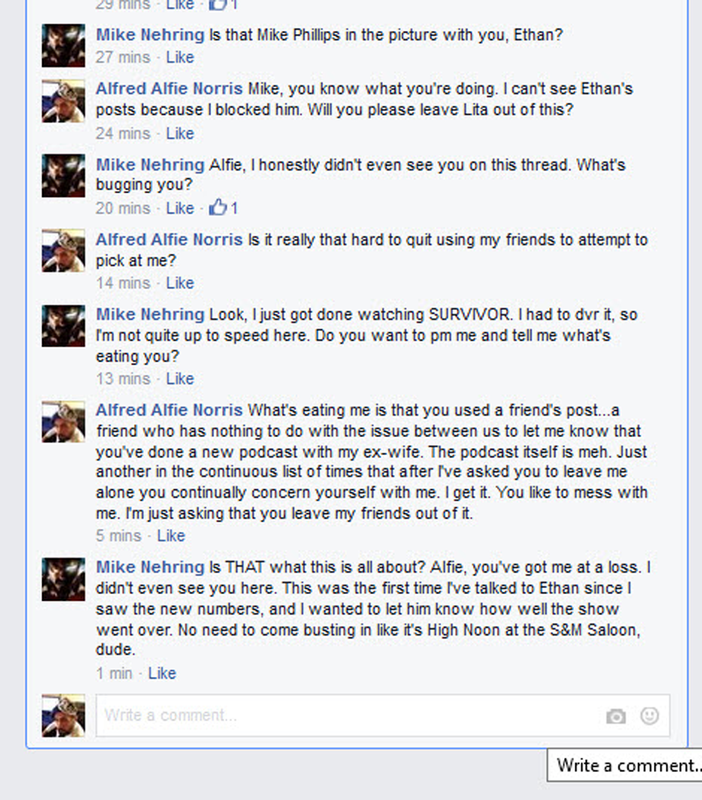 This back-and-forth climaxed when Nehring barraged Alfie with insults, leading him to demand Ethan to get him to take it down. When that was unsuccessful, Alfred took to his own Facebook page to announce that Ethan and his gang were attacking him. That appeared to have pissed Van Sciver off. “I’m SUPER PISSED. I feel like choking you,” he wrote in a DM to Norris. This leads to a falling out between the two. With Ethan not being sure whether Alfie was a friend or a fan. Alfie elects to just cut off contact with Ethan. A few weeks on, Ethan tried to make amends by refriending him. Alfred declined. 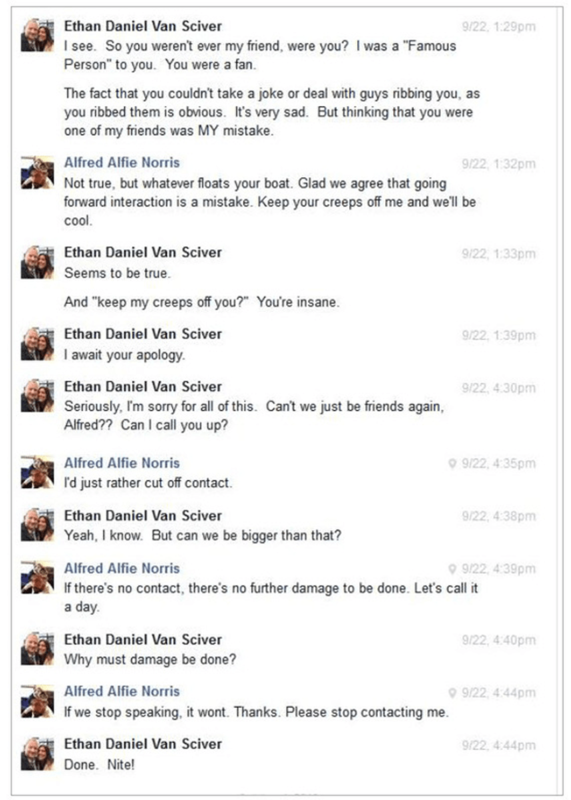 Norris then shares a screenshot from November that shows Ethan asking Alfred to leave HIM alone and that Alfred was getting paranoid about Ethan’s involvement in his life. In April and May 2014, it looks like Van Sciver made an effort to work things out with him. Part 2 ends with Alfie circling back around to what looks like that November 2013 conversation a second time, for whatever reason. This time we see more of it. Ethan tells Alfred “nothing happens that I don’t know about” when it comes to his friends. What that amounts to here is Ethan telling Alfred “nothing happens that I don’t know about” when it comes to his friends. 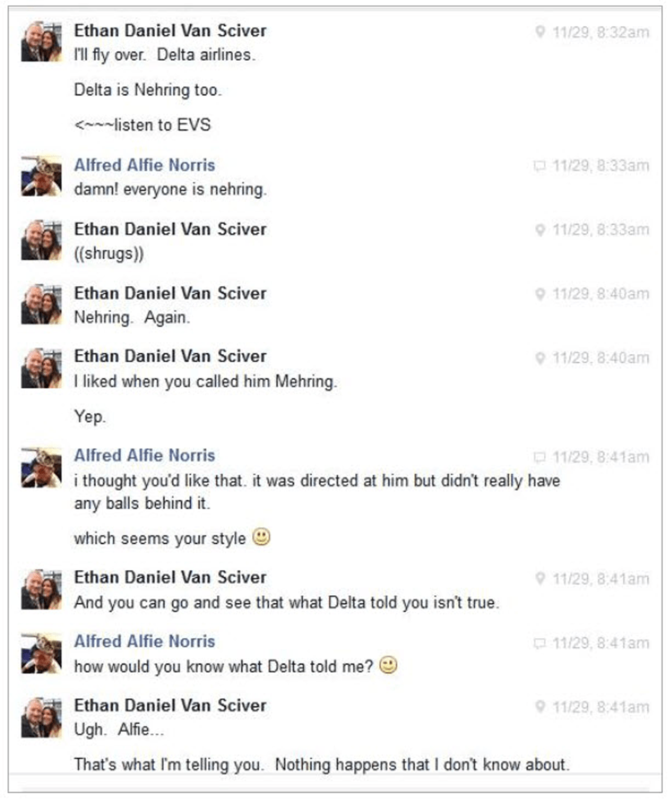 What that amounts to here is Ethan telling Alfred that Nehring has four fake accounts messing with Alfred. That’s the long and short of Alfie’s side of it. He claimed to be a victim of a system of cruelty under Ethan Van Sciver’s leadership. But with that said, Ethan’s response video offers evidence to cast doubts on Alfred Norris and his narrative. So as you can imagine, Ethan refutes Alfie’s assessment. He says it was more like Ethan posted a mildly partisan political article where he would express his sincere opinion, admitting to over-enthusiasm at times in that respect. Ethan invited folks to come and debate it, maybe “roast” each other too. Alfie joined in on that. While Alfie didn’t provide proof for this, Ethan says he has some. He sets it up by explaining he’d have to step in sometimes if discussion got out of hand. 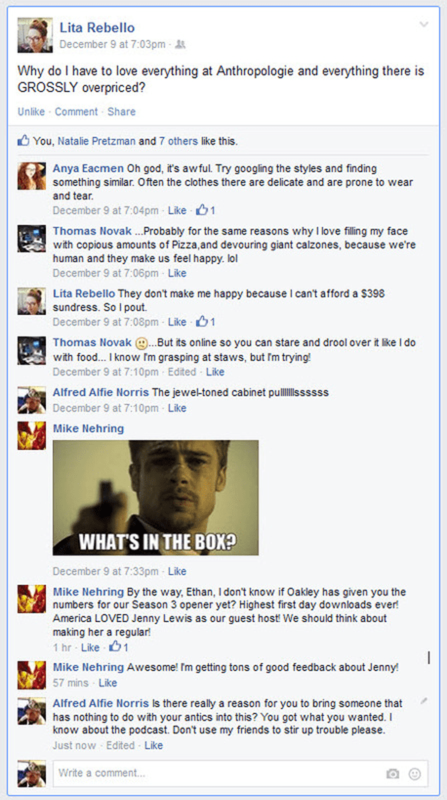 Ethan shows us these comments from Facebook to demonstrate Alfie provoking people, in addition to showing the contrasting reality of how people actually responded to Alfred, rather than what Alfie alleges. Ethan says Randy Pare was another person who showed up to the board saying provocative, over-the-top things in a similar fashion to Alfie. Steve Seitz was a liberal who posted crazy things. Ian Auld showed up and threatened to kill people. “That’s correct,” Ethan says in reply to the charge that he liked to mess with Ian Auld. Here it meant posting political articles to get Ian cursing Republicans. Ethan points out nobody had to come to his Facebook page. That choice was always left up to everyone else to decide. Ethan says the four snapshots used to prop up the IGN forum post were from sock accounts used by Jeff to inflate the situation’s impact on the community-at-large. “I don’t know what this is. I don’t know what he’s talking about here,” Ethan answers in response to the section of the blog where Alfie says he attacked women. Ethan says he never said any of that. That Alfie’s attackers were high-spirited guys. He never “strung” Alfie along. “I condemn your attackers. 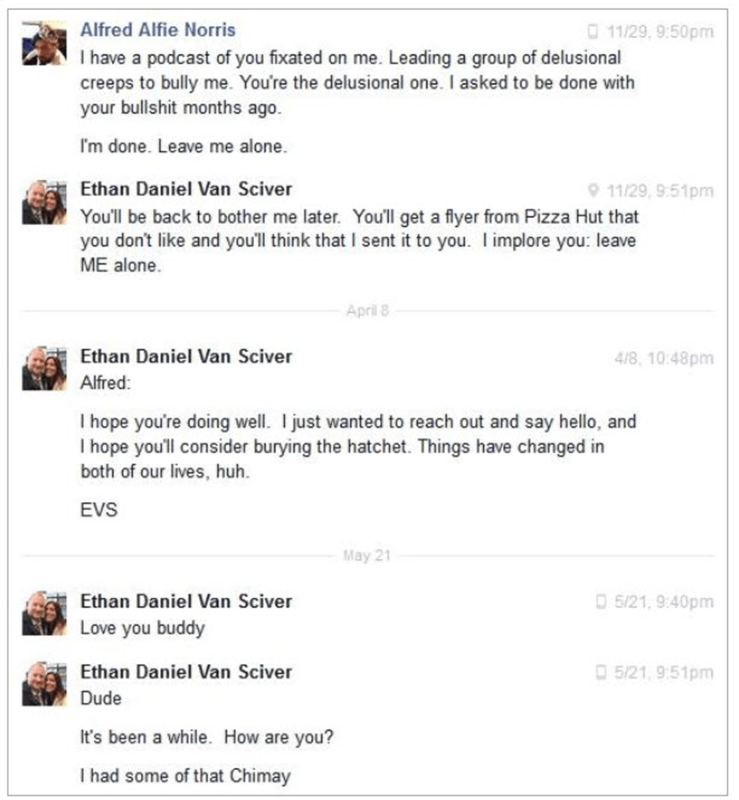 I acknowledge that you have been on the receiving end of a lot of harassment.” Ethan says the reason for that (in Van Sciver’s assessment of the situation) is when Alfie was on Ethan’s Facebook page he made a lot of enemies with strangers. Van Sciver says he was busy working on assignments while he was doing this sort of thing. Ethan points out Alfie’s general reputation among the group. Ethan explains the context behind what Michael Nehring had done to Alfie exactly. Ethan says Jimmy Bradbury was the character Nehring was playing. The “seeing if you’d be super cruel” line is in light of the context of Alfred being abusive towards Nehring, and seeing what Alfie would do when given this seemingly sensitive information about Nehring. So what was the other side of the story behind the “I feel like choking you” bit? “Somebody posted something mean about Alfie, I found out who it was, I think it was on my Facebook page, and I took it down.” Ethan left it up initially, and so Alfie said “Ethan is responsible for harassing me.” which led Ethan to say the “Take down that message” line. Ethan still viewed Alfie as his friend after that “I feel like choking you” line. He was just on Van Sciver’s “last raw nerve” by this point. That led to their first falling out in September 2012. The story gets hard to follow here as Alfie is jumping around the timeline throughout. Here’s the DMs he presents next in his piece, arranged properly for the sake of clarity. Ethan says he came back twice. Six months later, then a year later. Just to ask Alfie if he was still mad. “I did contact him unwantedly twice and I’m sorry,” Ethan admits. Van Sciver says they were both friends and he got the wrong impression. Alfie posts 11/29 a second time. Ethan points out that Alfie used the screenshot twice and that events were placed out of order. It looked like he contacted Alfie after their falling out. When it comes to “Nothing happens that I don’t know about.” Ethan says he was kidding around. “Those 4 IDs” were all telling him about the Dancing Hippo. Part 3 is where we get some clarity. Alfie and Ethan made up enough to the point where he went on Ethan’s “VANSCIVERTOWN” podcast. In his response video to Alfie, Ethan explained what exactly this show was. The episode in question took place on May 3rd, 2013. Alfie, Ethan, and the other guys had a civil conversation for the majority of the show. Even back then he was telling people outright “i’m just one of the guys, not a celebrity.” Alfie was quiet for most of the time, telling the gang he had to scoot out at some point to see Iron Man 3. But he stayed anyway and he loosened up some. Even saying it was “going better than [he] thought” at one point. You take that, add a drunk Michael Nehring, and you throw in a debate about politics? It was a recipe for disaster. Alfie took that back-and-forth banter personally and left suddenly. It was such a spectacle that it made sense for Ethan and the podcast crew to talk about that ordeal for the rest of the show. The follow-up show happened on May 15th, 2013. Alfie wrote a letter and Ethan read it on-air. On the podcast itself, Ethan says he “didn’t have issues with Alfie, Alfie had issues with” him. In regards to the “fags” comment, Ethan says that was a byproduct of growing up with four brothers and a neighborhood full of Italians. They beat each other up and call each other names like that. He notes Alfie was madder at him for not sticking up on his behalf, more than the guys who actually yelled at Alfie in the first place. Ethan explains in his response video that there was an effort on his part to mediate the heated tensions between Alfie and others in the Facebook group. Alfie says he didn’t block them because he didn’t want to exacerbate the situation. Again he mentions “daily” “derisive” comments on Facebook (on his own, on his law firm’s, and his girlfriend’s) yet he shows no links to that. Again. 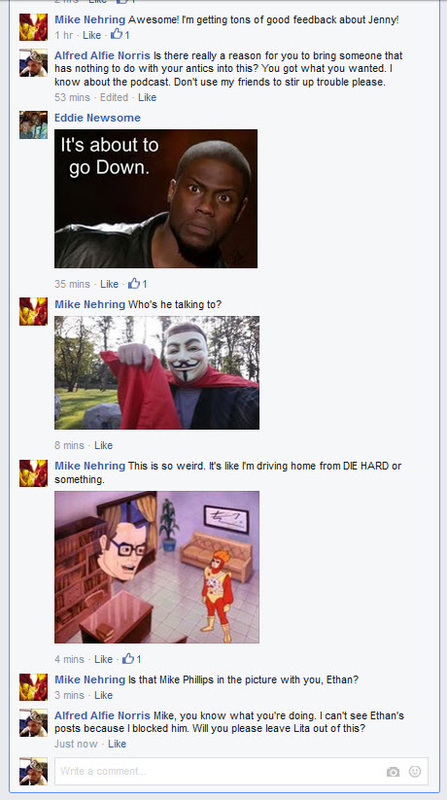 The instance he *does* demonstrate screencaps of is from a thread on a post by his friend Lita Rebello. However, we can’t see any comments by Alfie because here he apparently blocked Ethan, contradicting his own earlier statement saying he didn’t block him. If you analyze the contents of the thread itself, Mike Nehring and Ethan (assuming his comments are even there because we can’t see them) are simply carrying on a conversation about the podcast. This bothered Alfie and he goes out of his way to make a dramatic situation out of nothing. 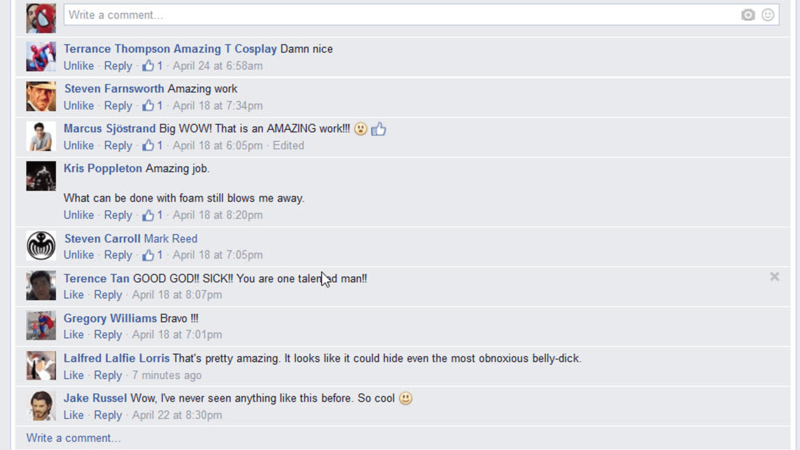 Next, he shows three random comments on his girlfriend’s modeling page photo. Alfie had issues with the wording of them and says they were references to other things. There’s no direct attack on Alfred there at all. Where this *is* happens in the next photo. A fake account going by the name of Natasha Knight comments and says “Alfred Norris raped me,” alleging Alfie and Bill Cosby took turns on her. Later we see a photo from Alfred telling Kevin Oakley to stop contacting him, even though we haven’t seen anything insinuating Kevin was in the first place. Alfred shares another message of the same request soon after. But beforehand he sandwiches in a screencap from a *different* Facebook user that DM’ed him confusingly. Plus, a message from Ethan thrown in. Passed along via a mutual contact after he and Alfie had their falling out. To clarify the confusion this message is real despite the fact it comes off as possible Alfie wrote this on his own accord. No. I checked with Ethan. It happened. Alfie was talking about Ethan negatively on his Facebook page, stirring the pot. Ethan heard about it and asked him to stop. The conflict between the two led to the message you see above. The context of the message is Alfie’s job as a cosplay costume maker is illegal (thus the mention of copyright attorneys). DC Comics doesn’t crack down on the process itself with an iron fist. But, with Alfie Norris going to the degree and capacity of which he did make the higher scale of his business apparent. It turns out reportedly Alfie Norris was taking people’s money and didn’t produce costumes anyway. Alfred’s blog is hard to follow. It gets easier when we get into the section about fake accounts. 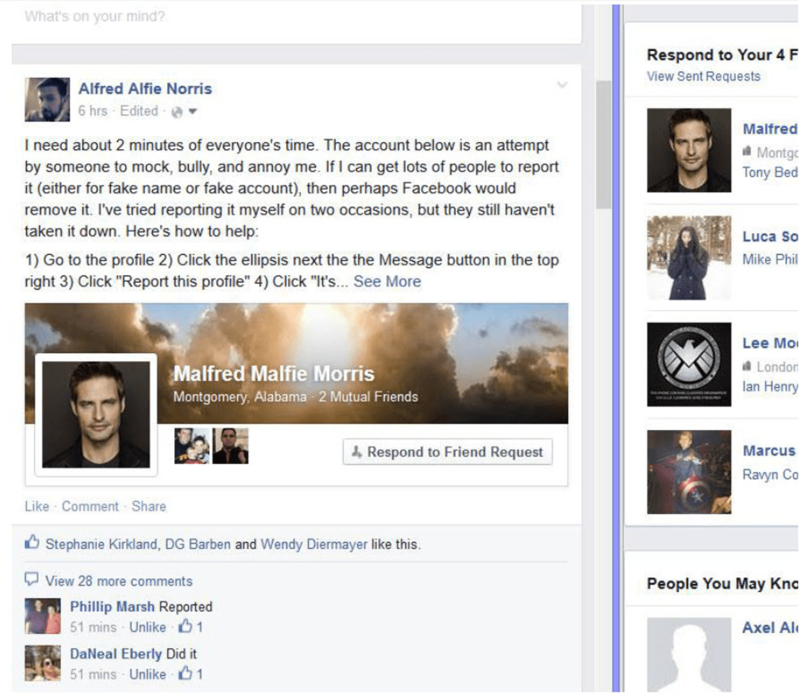 Alfie shares a post demonstrating he asked his friends to help report a fake account. That one was Malfred Malfie Morris. 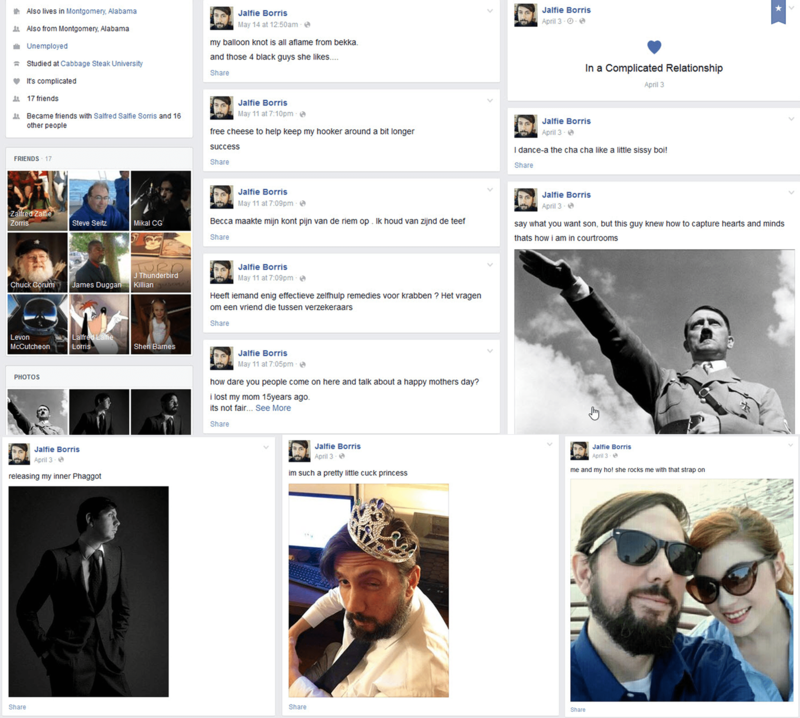 Jalfred Jalfie Jorris made sexual comments on one of his girlfriend’s Facebook posts. 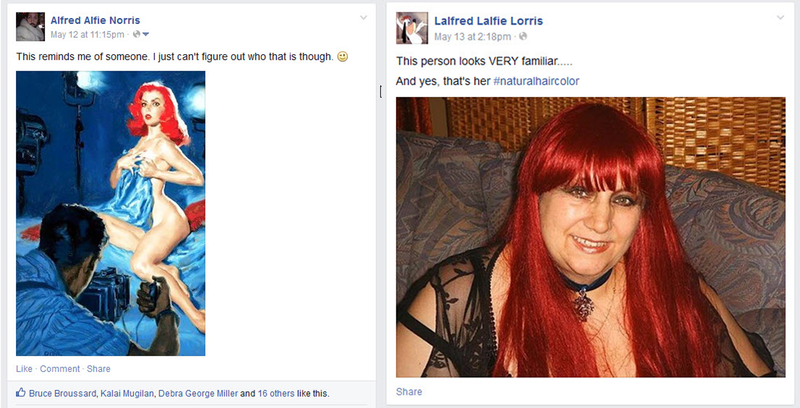 So did Lalfred Lalfie Lorris. We see Lalfred went further and commented on Alfie’s own posts, going as far as to mirror posts by Alfred on their own Facebook page. On more than one occasion. On another occasion, there was a Jalfie Borris calling Alfie “Hitler,” “Phaggot,” and a “pretty little cuck princess.” Then there was a Zalfred Zalfie Zorris, an Alfred Alfe Norrees, Halfred Halfie Horris, and Salfred Salfie Sorris too. The last remaining bit involves an Adam Kast. He contacted Alfie pretending to want to mend the fence, but the conversation went elsewhere in what looks a troll effort by Kast to get some kind of legal representation from Alfred. A majority of part 3 is from people that aren’t Ethan but Alfie alleges Ethan was behind it anyway. Ethan admits Alfie went through a lot in that regard. He does not believe the fake accounts were from him or anyone he knew. It was some time after they stopped being friends that Ethan heard about things Alfie was involved in, like the story of Socies Wilson. As someone who has an interest in cosplay and convention stuff, Socies had a run-in with Alfred Alfie Norris. Specifically, Alfred is alleged to have made sexually charged comments towards this girl. Who at the time was underaged. Socies revealed this on August 15th, 2017. Coincidentally around the same time Ethan Van Sciver was facing another wave of social media backlash. Wilson came out of a hiatus she was in to tell this story, along with some encouragement with her friends to motivate her. Socies removes herself emotionally as much as possible. That’s intentional. She says it’s so the public can review the facts and make their own mind up as best as possible. 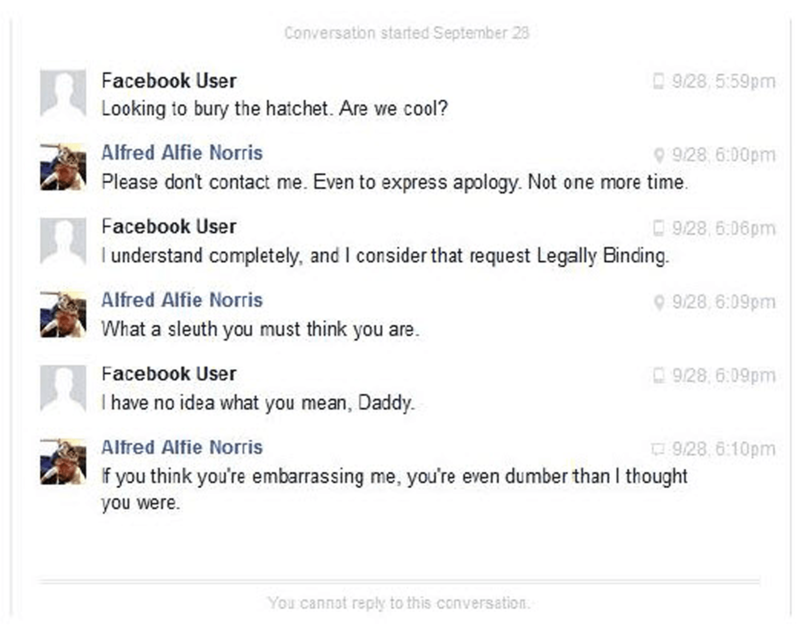 Below are the screenshots Socies shared of her encounters with Alfie Alfred Norris. “Im to the point where I’m wondering how hard it would be to get green makeup off from your body off my junk,” Alfred wrote. Looking into the matter further, I managed to get a copy of another DM exchange Alfie sent someone. This comes from a reliable source that’s close to the situation. It’s unclear whether or not these situations Alfie may have been involved in could be related to the brief loss of his license to practice the law. Past records indicate Alfred Norris was suspended in 2016 in the state of Alabama, with a further recent reprimand taking place this past January 23rd. The two incidents of 2012 and 2015 were enough to get the public to believe Ethan Van Sciver is a cruel maniac who sends his fans to mob random people. The person who wrote the IGN forum post from 2012 wants you to believe that Ethan and his ex-wife were vindicative enough to put a target on their back for a charity effort. But as you saw Ethan explain, the other side of the story indicates the key details that were painted in a different light to look more favorable for Jeff Hertz. He thought he became friends with Sharis. However as Ethan went over, Sharis didn’t exactly see themselves as Jeff’s friend. That forum post set an example of how to come off as damning, however. Enough so that Alfie Norris was able to adapt that example for his own four-part series. One that Alfred says tells the story of how Ethan (the “ringleader”) led a gang of tormentors to use him as a punching bag. Yet again though there’s another side to it. 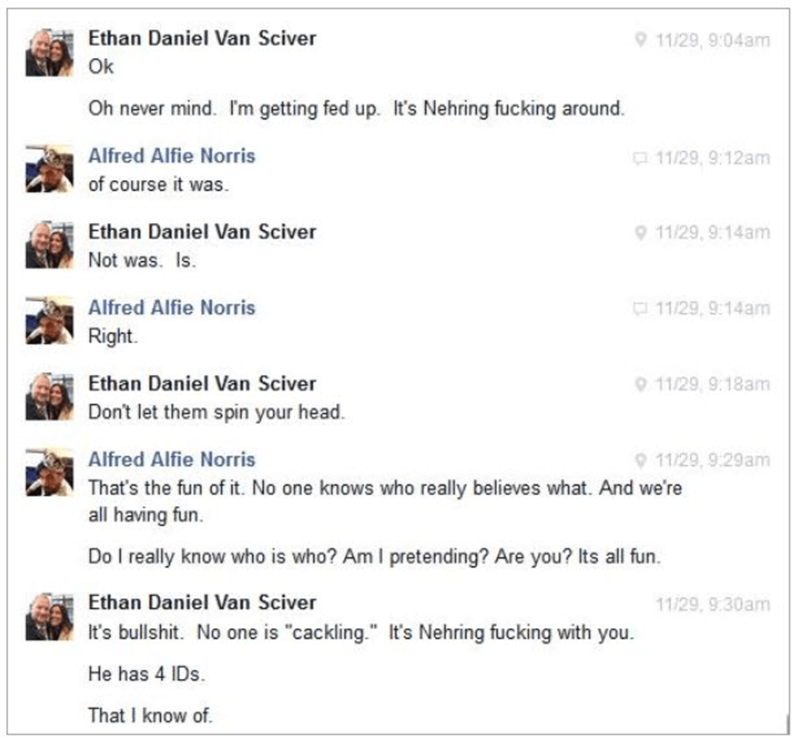 As Ethan discussed in his video explanation, his friend Alfie Norris wasn’t exactly someone who came off clean in this ordeal. 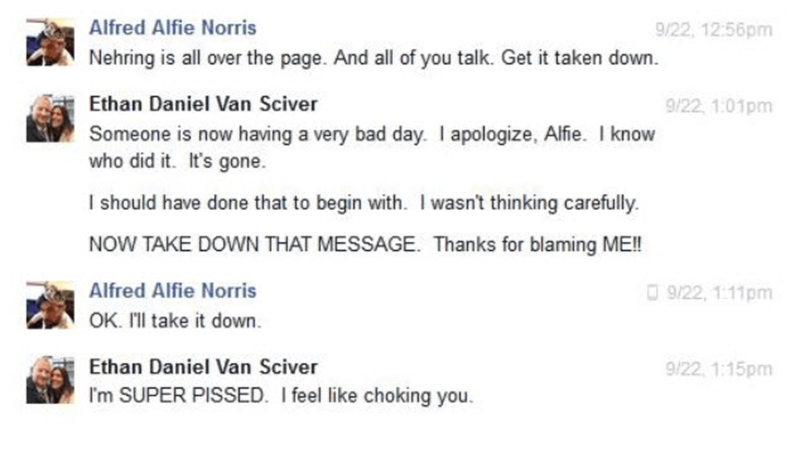 Ethan Van Sciver showed sufficient evidence that demonstrates that Alfie Norris had a “provocateur” reputation on Ethan’s Facebook page. He looked for fights, and the variation between what Alfie says occurred and the reality of it is striking. When Ethan and Alfie had their falling out, it became clear he had more on his plate than he thought. Which in itself Ethan condemned. But there’s still another angle we need to go over with the Ethan Van Sciver situation. Who is Diversity & Comics? What exactly is ComicsGate? These two elements serve as a backdrop to this online environment that every played out in.